The vision comes first. The ‘how to’ will follow. Kennedy knew the power of a vision and its effect on our brain – although the actual science of how the brain opens up and discovers the “how to” was not fully developed until later. How does the “how to” part of your brain work and how can you put it to work in your company? At the base of your brain is a dense group of cells called the reticular formation. This part of your brain is about the size of your little finger and is called the Reticular Activating System, or RAS for short. 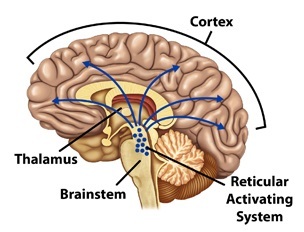 A drawing of the brain, showing the location of the RAS, is included below. The RAS operates as your onboard Google search engine. Program in what you are looking for, and RAS will find it. Want to go to the moon, RAS will seek and find the way. Scientists estimate that approximately 80% of the technology to go to the moon did not exist when Kennedy gave his speech. The vision came first and activated the RAS to search for “how to”. The RAS operates on two pathways. One pathway handles searches based on what we want, value, or love. The other handles searches based on what we fear or don’t want. We do the programming—and determine the pathway—with our thoughts. Anything that doesn’t fit the search is filtered out. Dr. Sperry, Nobel Prize winner in 1981 for his brain research says, “Whatever you focus on expands.” In other words, you will see more of it. Your RAS will help you notice things you weren’t seeing before and will improve or hurt your performance based on how you program it. Here is an example of how your RAS works. Think of a car you really like or value. It may be the make and model you are driving right now. Imagine you and I are riding in your car. When a car like yours (or the car you want) goes by, do you notice it? Of course you do. Why? Because you value that car, and your RAS opens up and spots it. I have a different favorite car. When it goes by, I’m the one who notices it. You don’t notice the cars that are important to me, and I don’t notice the cars that are important to you. We only see the cars we value. Here are two people in the same car going down the same road having two totally different experiences based on our RAS programming. We see different things based on what we have programmed as valuable into our RAS. Why is this important as a leader? We are responsible for clarifying the vision. What we and our team focus on expands. Are we focused on what we want and value? Our RAS will search for “how to”. Are we focused on what we fear or don’t want? RAS will take us there as well. Have you ever seen a sports team get ahead and then focus on “not losing”? What happens? They lose. What you focus on expands. During the great recession, I was coaching the CEO of a large real estate company. I asked him about his vision. He said, “My vision is to not go out of business.” I asked him if that was his vision or his fear? I then explained the RAS to him and helped him and his leadership team come up with a vision stated in the positive. His goal became “What do we have to do to thrive in this market?” And they did. The way your RAS works is a good news/bad news story. The good news: What you focus on expands. The bad news: What you focus on expands. Your RAS isn’t judgmental. It doesn’t discern right from wrong, positive or negative. It simply brings into your awareness whatever you choose to think about or focus on. So make sure you are focusing on what you want. Focus on the green, not the trap. Focus on making the free throw, instead of not missing the free throw. Focus on gratitude, wealth, and abundance, instead of fear and scarcity. Your RAS can quickly start a feedback loop that’s either positive or negative. Mother Teresa was invited to an antiwar rally, and she declined the invitation. “When you have a peace rally, I will attend,” she said. She understood. Focus on what you want (peace) versus what you don’t want (war). Notice how we used to have a War on Cancer, and now we have the Race for the Cure. Set your vision in the positive and put your RAS to work for you. Your vision comes first, the “how to” will follow. Larry Kendall holds a master's degree in Business Administration from Kansas State University and is one of the founding partners of The Group, Inc., a real estate company with two hundred sales associates and six offices in Northern Colorado. He is the creator of Ninja Selling, a sales training system with over fifty thousand graduates in the US, Canada, and Spain. Kendall's mission is to help people bring out the best in themselves and their organizations. He lives in Fort Collins, Colorado with his wife, Pat. Kendall can be found on Twitter and Facebook. His new book, Ninja Selling, is available on Amazon as well other fine booksellers.